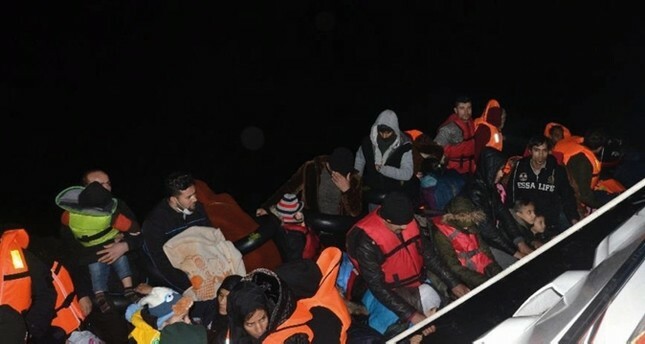 Turkish coast guard on Monday rescued 69 irregular Afghani migrants, including 36 children and 17 women, who were stranded off the coast of western Turkey's Kuşadası when the motor failed in their rubber dinghy. According to information released by authorities, the migrants called for help after their dinghy began to sink on their way to the Greek island of Samos. The coast guard spotted the boat and mobilized to rescue the endangered migrants, who were from Afghanistan. The migrants were delivered to the immigration office after their statements were taken and they were provided with food and health checks. In recent years Turkey has been a main route for irregular migrants trying to cross to Europe. Turkey and the European Union signed a deal in 2016 to curb illegal immigration through the dangerous Aegean Sea route from Turkey to Greece. Under the deal, Greece sends back migrants held on Aegean islands after they crossed over from nearby Turkish shores, and in return, EU countries receive a number of Syrian migrants legally. The deal, reinforced with an escalated crackdown on human smugglers and more patrols in the Aegean, significantly decreased the number of illegal crossings. However, some desperate migrants still take the route, especially in winter months when a safe journey through the Aegean is nearly impossible aboard overcrowded, unsafe dinghies. Deaths are common in crossings to reach Greek islands scattered across the Aegean, only a few kilometers away from Turkish shores.